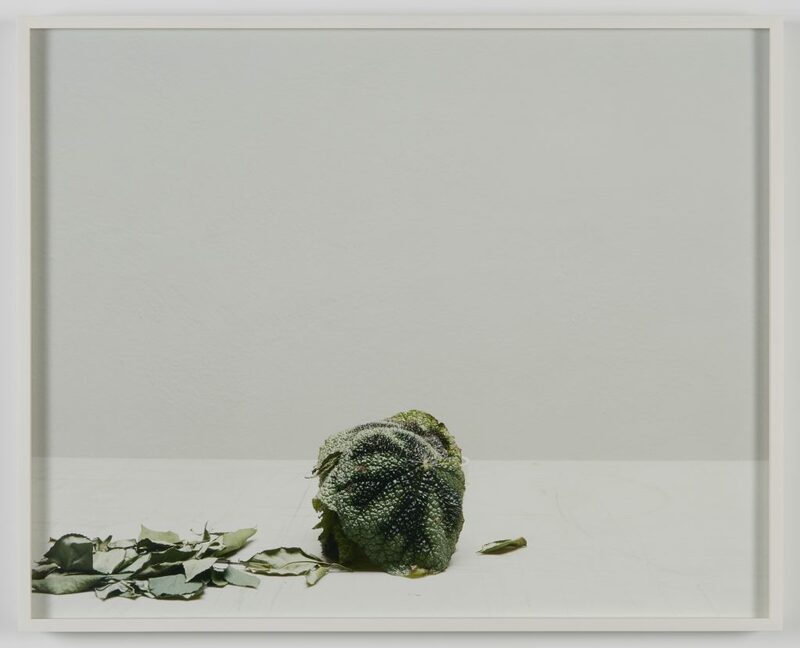 In Melanie Schiff’s new photography exhibition Fair is foul, and foul is fair, she reprises a lineage of art historical genres—the portrait, landscape, and still life—from the vantage point of contemporary California: a woman’s blonde hair glints in raking light, a bungalow nestles behind its overgrown garden, two candles burn. Like a low hum that you feel but can’t quite hear, a lingering unease haunts the seemingly benign. Schiff has long innovated from within, rather than against, a certain classicism. Strategic tweaks in subject matter or photographic technique, (she shoots exclusively in film), kindle quiet insurrections, blurring the lines between observation and dramaturgy, the scenic and the uncanny. 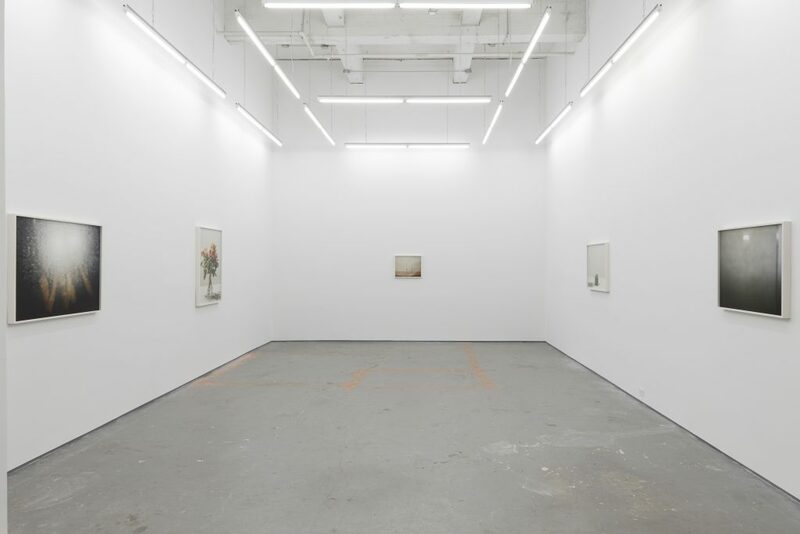 Her recent works delve even deeper into inherited genre but rupture its placidity slightly differently: rather than invite idiosyncrasy, Schiff agitates through subtle shifts of light and texture, or via methods of repetition and veiling. 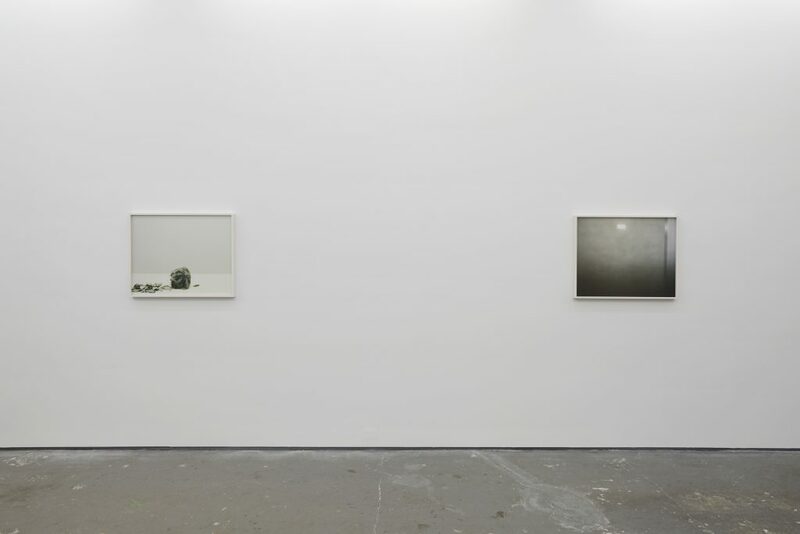 Narrative is dispersed, so that the photographs appear together as modular elements in one long, elegiac verse. 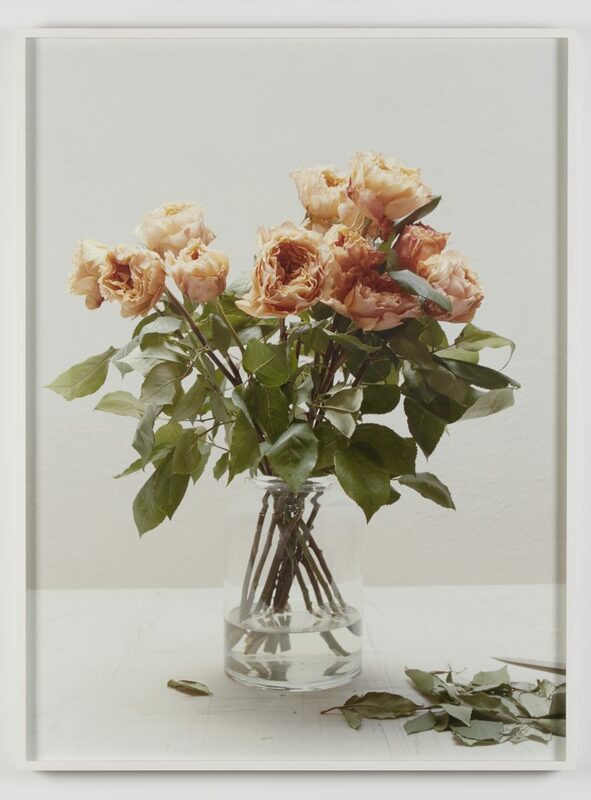 In White, Roses (2016), a vase of fading flowers is captured with arresting clarity against a clean white backdrop. 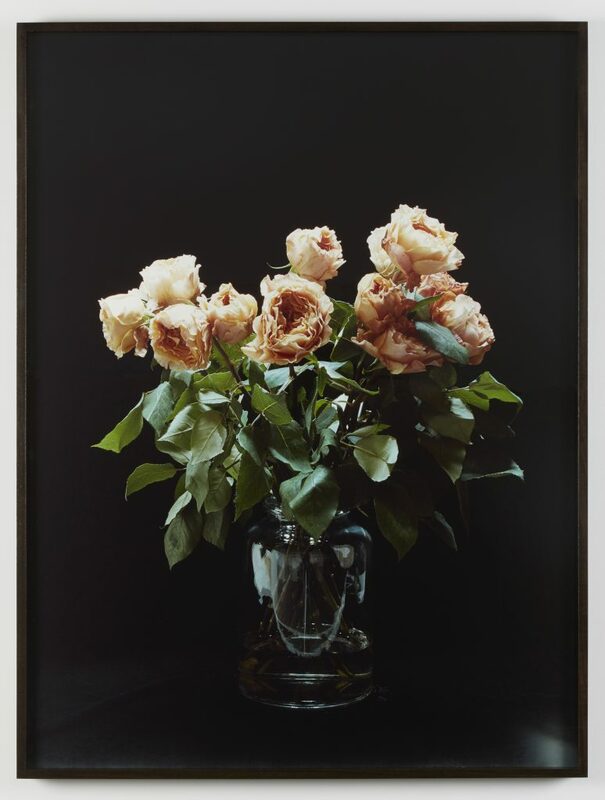 These same roses reappear in another work, rotated slightly and this time against a cavernous black (Black, Roses, 2016). 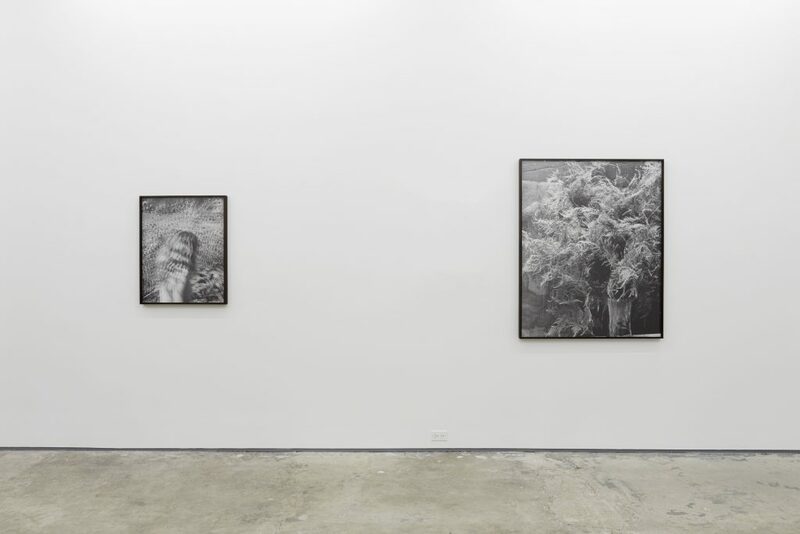 Doubling is a staple of Schiff’s oeuvre, occurring both between works and within single images. 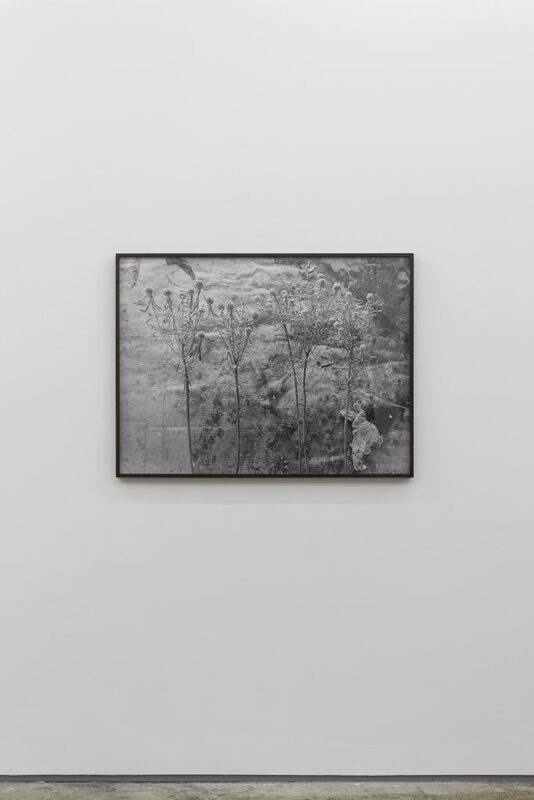 Double Flash (2016), for example, captures her reflection, twinned by multiple exposures and obscured by the echo of flash in mirror. This doubling and veiling resurfaces on a physical level in Two Candles (2016). 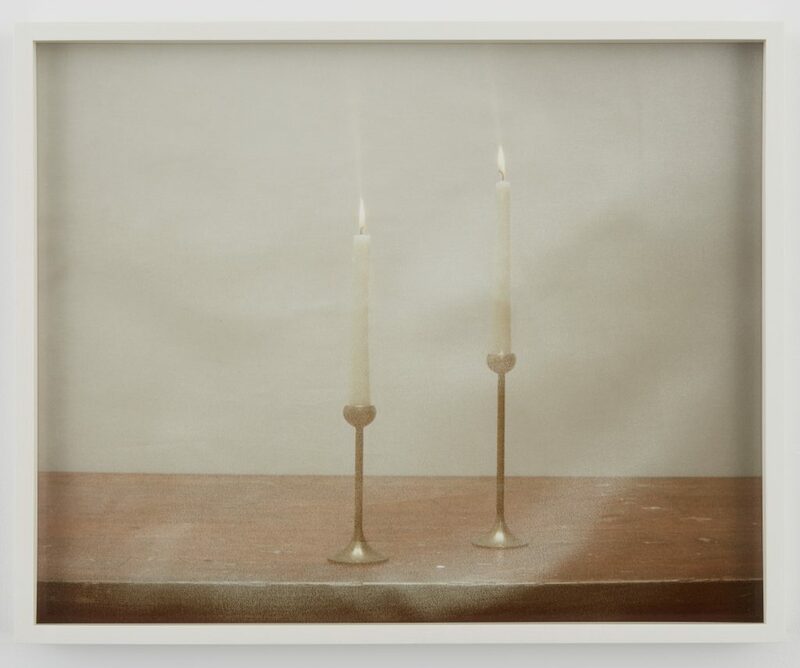 What appears initially as a tranquil still life is complicated by an undulating haze clouding its surface—in fact a thin, almost transparent fabric suspended between the camera and the two candles it observes. 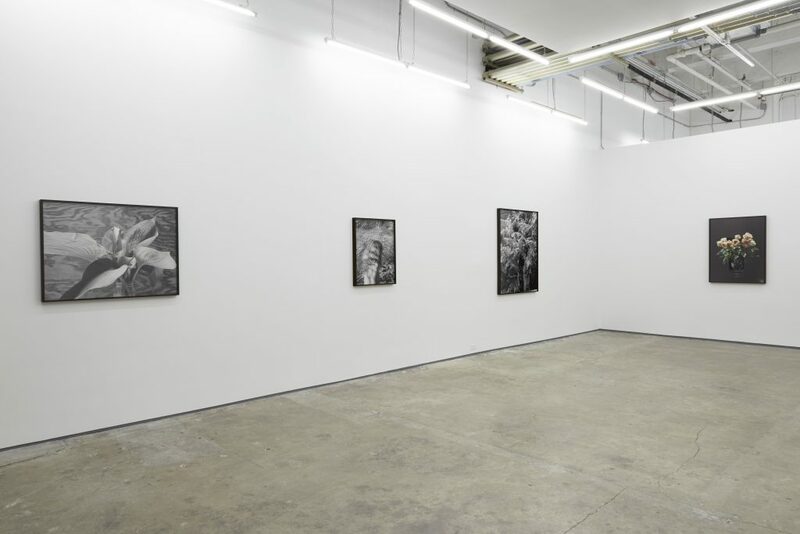 Schiff’s use of repetition and haziness cleaves open a gap between subject and object of gaze, disturbing photography’s promise of spatiotemporal proximity and eliciting from her viewer a literal second glance, a visual stutter. Her manipulations nevertheless remain within a staunchly material register: hanging a veil, or slowing a camera’s shutter, sometimes twice. In a cyclical turn, the familiar is rendered strange by means of the familiar, suggesting the aching, mundane materiality of the most eternal motifs—even the rose. Seen twice, Schiff seems to suggest, the symbolic is returned to the real. This deflated symbolism resonates in the natural elements that recur throughout. We’re offered not only roses, but also ferns, leaves, a hawk. 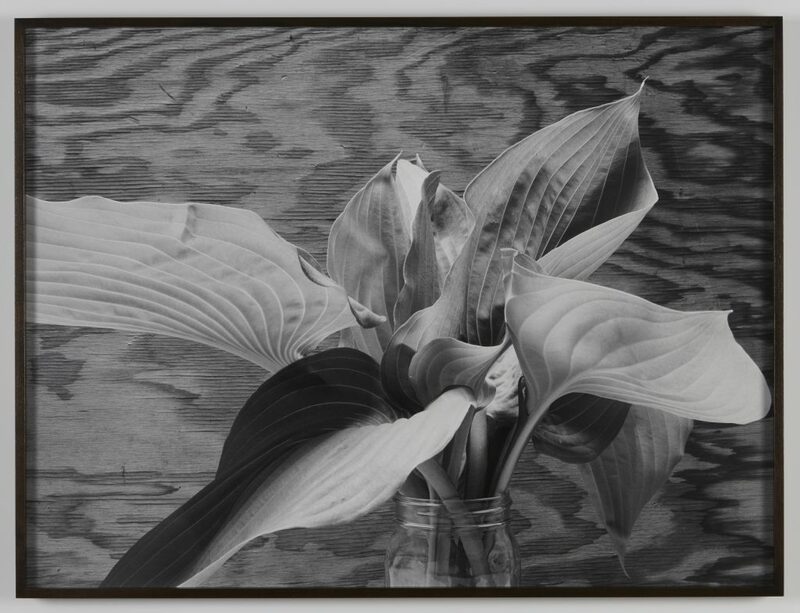 The focused botanical gaze of these images recalls that of Imogene Cunningham, but this nature is further gone, in fact quite literally morte. The plants are uprooted—dried up or displayed in vases—and the hawk lifeless. Here, as in the image of candles, Schiff invokes the ritual of the vanitas: paintings whose symbolic lexicon reminds their viewer of the transience of earthly life. She enters this tradition while keeping one foot in a definitively materialist realm, adopting allegory if only to push it away once again. 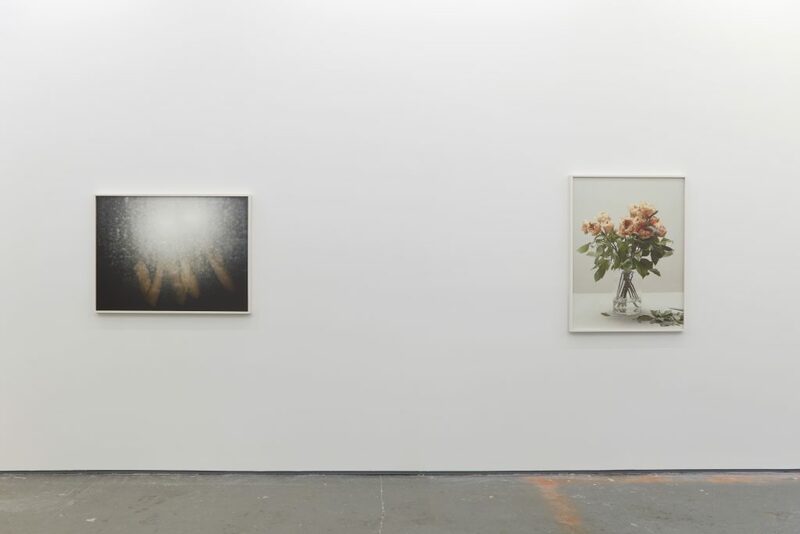 If thoughts of mortality tug at the hem of these images, Schiff reroutes them to consider a lack at the heart of photographic process itself; as Roland Barthes has famously argued, photography cannot help but imply loss, insofar as it holds it at bay. 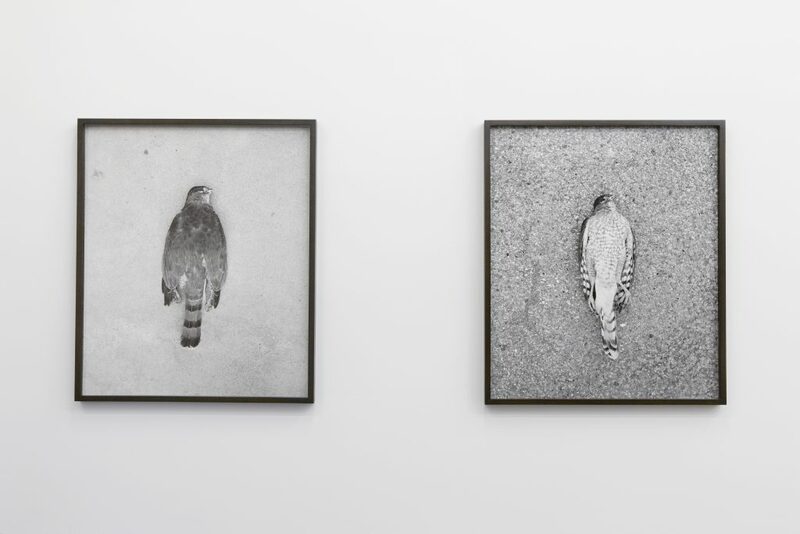 Pigmented inkjet print, 40 3/4 x 30 3/4 x 2 inches (framed). Edition 1 of 3 with 2 AP. 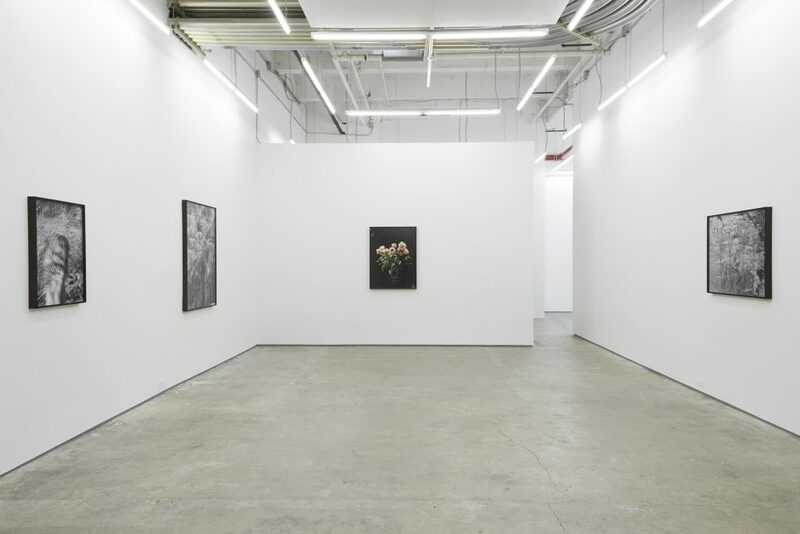 Courtesy of the artist and Kate Werble Gallery, New York, NY. Pigmented inkjet print, 30 3/4 x 40 3/4 x 2 inches (framed). Edition 1 of 3 with 2 AP. 16 3/4 x 20 3/4 x 1 1/2 inches (framed). Edition 1 of 3 with 2 AP. 40 3/4 x 30 3/4 x 2 inches (framed). Edition 2 of 3 with 2 AP. 24 3/4 x 30 3/4 x 2 inches (framed). Edition 1 of 3 with 2 AP.